When it comes to designing an oil drain pan, it is a surprisingly difficult task. While you could technically catch your oil in a salad bowl if you wanted, this wouldn’t address the two largest challenges when it comes to oil drain pans: oil transportation and easy cleanup. Typically, easy clean up comes at the expense of easy transportation. Oil drain pans where you can drain directly into the pan without the use of funnels tend to leave little mess, however when you close them oil tends to seep past the seals when you turn it upright to transport. Conversely, the pans with integrated funnels tend to keep oil inside once closed, but you have to wipe down the entire outside of the pan which is a messy job. In light of these challenges, GarageBOSS has come up with an innovative oil pan in attempt to get the best of both worlds, and they were kind enough to send one for evaluation during an oil change on our 2006 John Cooper Works Mini Cooper S. The GarageBOSS 12.5 quart plastic drain pan and funnel is a modular design with a detachable funnel that snaps into a slot on top of the pan when not in use. 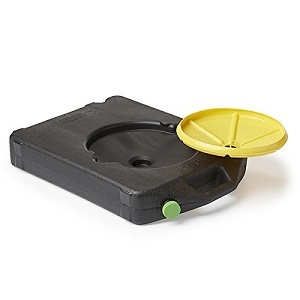 To use this pan, you remove the funnel and screw it on to the fill port to drain your oil. The major benefit to this is that the only part you have to clean is the funnel, which is much easier as it is removable. Additionally, because the fill port is only 1.5″ in diameter, there is very little chance of oil leakage once you screw on the cap. We also commend GarageBOSS for positioning both caps at the very top of the pan when positioned upright, which minimizes chance of leaks . Regarding our oil change on the Mini, with the funnel installed, the clearance height for the pan was about 6″. This is about average height for an oil pan, so you should plan on using a good floor jack to get your car up in the air if your car sits low like our Mini. We drained our oil with no problems or spills. Afterwards, we removed the funnel to notice a little oil residue on the threads, but none seeped past so there was no real mess to speak of. A quick wipe with one paper towel was enough to clean up the pan itself. Cleaning the funnel was pretty easy as well, especially since it wasn’t attached to a pan full of warm oil. Afterwards, we snapped the funnel back into place, gave the pan a shake and tipped it upside down for a few seconds to see if any oil would leak past the caps (and it should be noted that we use synthetic oil which tends to find leaks a little bit faster than conventional oil). We were pleased to report that we did not notice any oil leak past the caps during our shake test, which means that you could confidently transport your oil without worrying about it. Overall, the GarageBOSS 12.5 quart is a great oil pan with some unique features that distinguish it from other oil pans. As far as where to buy, Amazon has attractive pricing and is worth checking out. Should you decide to pick one up, we think you’ll be as happy as we were to add it to our arsenal. If you find that you are looking for something slightly different, take a look at our guide to best oil drain pans. Happy wrenching! Click here to see more images, read more reviews, and see prices.